When Uranium Energy Corp. sought permission to launch a large-scale mining project in Goliad County, Texas, it seemed as if the Environmental Protection Agency would stand in its way. To get the ore out of the ground, the company needed a permit to pollute a pristine supply of underground drinking water in an area already parched by drought. Further, EPA scientists feared that radioactive contaminants would flow from the mining site into water wells used by nearby homes. Uranium Energy said the pollution would remain contained, but resisted doing the advanced scientific testing and modeling the government asked for to prove it. The plan appeared to be dead on arrival until late 2011, when Uranium Energy hired Heather Podesta, a lobbyist and prolific Democratic fundraiser whose pull with the Obama administration prompted The Washington Post to name her the Capitol's latest "It girl." Podesta -- the sister-in-law of John Podesta, who co-chaired President Obama's transition team -- appealed directly to the EPA's second in command, Bob Perciasepe, pressing the agency's highest-level administrators to get directly involved and bring the agency's local staff in Texas back to the table to reconsider their position, according to emails obtained by ProPublica through the Freedom of Information Act. By the end of 2012, the EPA reversed its position in Goliad, approving an exemption allowing Uranium Energy to pollute the aquifer, though in a somewhat smaller area than was originally proposed. An EPA spokesperson said companies routinely lobby the agency on regulatory issues and that Podesta's entreaties to Perciasepe, now the agency's acting administrator while Obama's nominee to head the EPA, Gina McCarthy, awaits confirmation, played no part in the agency's final decision. "Bob's involvement was literally a part of what he does on a weekly or daily basis," the spokesperson said. "Lobbyists, etcetera, get in touch, he meets with them, he points them in the right direction." Factors other than Podesta's efforts clearly weighed on the EPA as the Goliad case played out, including the agency's fraught relationship with Texas officials and the Obama administration's desire to demonstrate support for energy development. Still, documents leave little doubt that Podesta, described by Corporate Board Member magazine as the number one person "you need to know in Obama's Washington," kept the Goliad County issue alive when the EPA's scientific analysis seemed to doom it to failure. Podesta did not respond to multiple messages requesting a comment. A spokesman for Uranium Energy said the company would not respond to questions. The EPA's then-acting director for the region that includes Texas maintains the Goliad exemption, which was issued last December, was carefully considered and based on science. But Miguel Flores, who spearheaded the EPA's Goliad review until he retired at the end of 2011, said members of his team were dissatisfied with the agency's flip-flop, especially because critical modeling on the flow of contaminants still has not been done. "We had worked long and hard on it," Flores said of the Goliad decision. "I think there was some level of disappointment." The net result has left some area residents feeling abandoned. "They gerrymandered the rules in order to get the aquifer exemption approved and gave the EPA an easy out," said Ginger Cook, who lives near the mine site in Goliad County and who is a plaintiff in lawsuits against the EPA and the Texas Commission on Environmental Quality. "So much for protecting the groundwater." The Goliad County case is the latest in a string of hotly contested challenges the EPA has faced in recent years as officials try to balance the drive to tap new sources of energy with the need to preserve water for future use in a changing climate. As ProPublica reported in December, the agency has used a little-known provision in the federal Safe Drinking Water Act to issue more than 1,500 exemptions allowing energy and mining companies to pollute aquifers, including many in the driest parts of the country. Sometimes, as in Goliad, the EPA has arrived at decisions that seem to run counter to the stated goals of the program, which is to issue exemptions only in cases where it can be proven beyond a doubt that the affected waters will never be used. Sources within the EPA say the agency has been quietly reevaluating its policy on aquifer exemptions, in large part because evolving geological sciences have shifted the understanding of the risks, and advancing technology and climate change have made water sources once deemed inaccessible more likely to be needed -- and used -- in the future. The way in which the Goliad exemption was approved raises new questions about how the EPA decides which resources to sacrifice, and whether its decision-making is subject to outside influence. By the end of this year, Uranium Energy will begin injecting an oxygen-enriched solution between 90 and 450 feet below the earth's surface into four layers of the Evangeline Aquifer. The solution will dissolve more than 5 million pounds of uranium deposits, freeing them to be sucked back out and processed for nuclear fuel. In the process, uranium, radium and other contaminants will be left floating behind in the aquifer. The company initially submitted its plan, along with groundwater data to support its case, to the Texas Commission on Environmental Quality, which approved it in 2010. But only the EPA has the authority to exempt an aquifer from the protections in the Safe Drinking Water Act and federal regulators had problems with the Goliad project from the start. Most aquifer exemptions approved by the EPA are in remote locations, but Goliad County residents draw water from at least 47 wells tapping the Evangeline Aquifer near the proposed Uranium Energy mine. Several wells were within a buffer zone set out around the pollution area. Two geologic faults sliced through the site, potentially opening a pathway through which contaminants in one zone could transfer more easily to another, or move vertically back toward the surface. Furthermore, groundwater experts say, the entire area is part of a recharge zone for the larger Gulf Coast Aquifer, which runs along the shoreline from Louisiana to Mexico. EPA scientists worried that the water would course through the ground, carrying contaminants from the mine zone toward Goliad residents' water wells. "I and the staff were concerned," said Al Armendariz, who, as the former regional administrator, was Flores' boss and the highest level EPA official in the regional office covering Texas, Louisiana, Arkansas, Oklahoma and New Mexico until he left the EPA last April. In May 2012, William Honker -- who replaced Flores as the acting director of the EPA's local Water Quality Protection Division -- asked Texas environmental officials to require Uranium Energy to conduct what it calls multiphase modeling of the flow of groundwater at the site, which would yield new data on the direction that contaminants would travel underground. In his letter to Texas regulators, Honker also described the data provided by the mining company as insufficient to predict how contaminants would spread from the site over the long term. "EPA believes there is a high likelihood that, following mining activities, residual waste from mining activities will not remain in the exempted area," he wrote to Zak Covar, executive director of the Texas Commission on Environmental Quality. Mining companies try to confine contaminants by pressurizing the aquifer and forcing fluids to flow back towards the mine and away from populated areas. But records and interviews with the Nuclear Regulatory Commission, which does not directly oversee mining in Texas but licenses similar sites in other states, show that pollution commonly seeps beyond exemption boundaries at uranium mining sites. Documents show that both Texas officials and Uranium Energy resisted doing the additional research the EPA asked for, maintaining that the evidence already presented to the agency proved that the contaminants would not affect nearby homes, and that water within the exempted area was not currently being used by residents. With the support of Texas officials, the company also argued that the EPA had issued such exemptions in the past and was re-interpreting its own rules to thwart the Goliad exemption without justification. In a testy retort to Honker, Covar accused the EPA of being "swayed by the unsubstantiated allegations and fears" of Goliad County residents. Officials in Goliad County urged the EPA to stand firm and couldn't understand why the state wouldn't want more testing. "This is simple hydrology. They say 'Well, in our opinion that fault is confining,'" said Art Dohmann, president of the Goliad County Groundwater Conservation District, the local agency that establishes groundwater management plans under Texas' statewide Water Development Board. "Well, we all have opinions, the pump test will tell you the facts." With the permit process at a standstill, EPA officials say by June 2012 they had decided not to allow the mine. "We were prepared at that point to leave the issue right where it stood," said Sam Coleman, who temporarily took over Armendariz's job as the EPA's top regional official overseeing the permitting in Dallas, and is now the region's deputy administrator. "We could not approve the exemption." Behind the scenes, however, Uranium Energy was pursuing another path to approval. The company hired Podesta, whose firm eventually received $400,000 for her services, according to lobbying records filed with the U.S. Senate. She reached out to Perciasepe, asking him to meet with Uranium Energy's executives because the EPA officials in Texas "did not approve" the aquifer exemption, emails obtained by ProPublica under FOIA show. Perciasepe agreed, and met with company executives in December 2011. "We greatly appreciate your assistance to bring Region 6 and UEC to the table to work through these issues," Podesta wrote in early 2012. When EPA officials in Texas began to push Uranium Energy to do more modeling, Podesta complained to Perciasepe. "Region 6 keeps changing the standards," she wrote in a Feb. 2, 2012 email. "I'm looking into it," Perciasepe replied, a day later. There is no indication that Perciasepe acted unethically in working with Podesta, but her involvement appears to have raised Uranium Energy's exemption request from a small-time regional concern to one that had the attention of the EPA's top staffers in Washington. She wrote Perciasepe more than 25 times over an 11-month period, requesting meetings and phone calls, and at least once interrupting Perciasepe's weekend. "Hiking. Will call later," Perciasepe wrote. Podesta often struck an informal tone, sending emails with subject lines such as "are we having fun yet?" and "rumors...sigh." The EPA says such lobbying is routine -- not only by energy companies, but by environmental groups -- and that part of Perciasepe's job is to listen to all sides and facilitate a conversation. Even environmental advocates say they view this as a legitimate part of the rulemaking process. At first, the pressure brought by Podesta didn't appear to have much of an effect. In mid-2012, EPA staffers in Texas were still resolved to deny Uranium Energy's permit. Honker and others pushed the company and state regulators for additional scientific study. In an email to Perciasepe, Podesta wrote that Uranium Energy was "frustrated" by the lack of clear direction and warned that Texas regulators might be considering a lawsuit against the agency because of the delay in granting approval. She urged him to bring the parties back to the table. By early summer the sides began to discuss a compromise. Uranium Energy would provide some additional scientific data to the agency and it would shrink the size and depth of the part of the Evangeline Aquifer that it proposed to pollute, but it would not have to do the detailed analysis the EPA had wanted. The area exempted would be about 27 percent smaller, allowing a bigger buffer between the mine site and the homes drawing water from the aquifer. 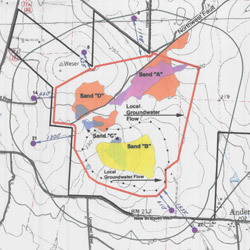 Some of the testing data previously submitted by Uranium Energy showed that underground contaminants would flow south east from the mine site, toward homes in Goliad County. Under the compromise, the EPA allowed the company to exclude this data as "anomalous"; the remaining data showed contaminants would flow east, narrowly missing the homes. In July, Podesta wrote to Perciasepe that "the progress made over the last few weeks would not have been possible without all of the time and effort you and your office have put into this project." The residents of Goliad County sensed a shift in momentum. Dohmann pressed EPA staffers for an update. "We're no longer in the loop," he recalled them saying. "The decision has gone upstairs, and we don't have any idea what's going on." When Goliad residents asked in August to attend a meeting between the EPA, Texas officials and Uranium Energy, Podesta wrote to Perciasepe that "we think it is odd to include the Groundwater District in the meeting." Dohmann did meet with EPA officials that August in Dallas, but he found Coleman evasive and said the agency spent very little time reviewing the groundwater test data the Groundwater District had provided them. "We could just tell that we were going through the motions, and that it had moved from a technical evaluation to a political decision," Dohmann said. In interviews, Coleman and other EPA officials firmly rejected the notion that politics ever trumped science in considering the exemption. The revisions to Uranium Energy's plan reduced the risk to Goliad's water, making further modeling "not necessary," Coleman said. In response to questions from ProPublica, Coleman sent a six-page document laying out how the scientific review process had quieted the EPA's original concerns. But several experts who reviewed the document said it raised additional questions. As one part of the review process, Uranium Energy conducted a so-called pump test to see if contaminants could migrate vertically between geologic layers or through the more than 1,000 old test wells that dotted the landscape. The results were negative, but it's typical to run larger numbers of tests rather than just one, said Mark Williams, a hydrologist at the University of Colorado at Boulder. "Probably more problematic is whether a single test is representative of the problem at hand," he said. The document summarizing the EPA's review also cited Uranium Energy's data on the underground flow of contaminants, minus the "anomalous" data it had allowed the company to throw out. But Dohmann said data collected by his agency was consistent with the discarded data, showing that groundwater at the mine site could move in several directions. When sent a detailed list of additional questions to clarify the data and scientific basis for their decision, the EPA deferred to the Department of Justice, which declined to comment because of the pending litigation. The Texas Commission on Environmental Quality, after soliciting and receiving detailed questions from ProPublica, also declined to explain the scientific rationale for their approval, citing a pending lawsuit by Goliad residents against the agency. On Dec. 4, the EPA issued the aquifer exemption to Uranium Energy. Days later, Podesta sent an appreciative email to Perciasepe. "Thanks again for your leadership," she wrote. "We greatly appreciate all the time you invested in this project and hope it is the start of a closer working relationship between the industry and the agency."